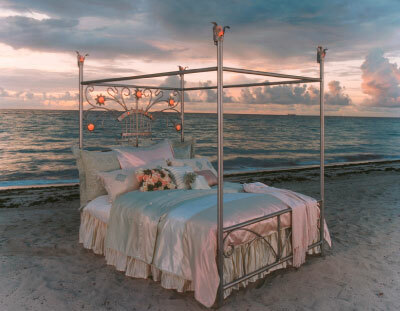 NOT A FANTASY: Bed designed by Terrence Tullgren is softly lit; the metal is gold-and-platinum-toned, and the headboard and finials are decorated with rose quartz. In his circuitous career, designer travels the world before settling in Miami where his exotic custom-made beds have become a sensation. Terrence Tullgren has traveled a circuitous road to reach his interior design career. His clients, like his on-a-whim life decisions, have taken him all over the world. From designing apartments in Argentina to decorating 18 condos in the Majestic on Miami Beach to jeweled beds – he takes everything in stride. 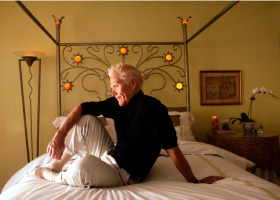 In a 30-year career, he has worked in the garment industry, founded a jewelry company with exercise guru Richard Simmons, acted in commercials and feature films in Brazil, designed movie sets and been a gem dealer before finally settling into interior design 13 years ago. “If you are a true designer you can design everything,” he says. After getting a degree in marketing, he attended the Instituto Tecnologico de Monterry in Mexico to study Spanish. His teen years were spent attending different schools in Europe, an experience he thinks may have fueled his wanderlust. Enter Richard Simmons. Tullgren and Simmons had been in an acting class together at Florida State University and met up again in Los Angeles. “He did the designing, I did the marketing,” Tullgren said. “After a while that didn’t work so we parted ways and I started designing the jewelry myself.” The geometric pins were hot sellers under the name, Simpatico. DIFFERENT STYLES: Tullgren's beds are crafted using wither metal or upholstery, as in this example. Back in Los Angeles, Mimi London, one of the era’s top decorators, was immediately interested. “Those huge stones were being bought left and right to be put on a table, you name it,” Tullgren said. He began selling polished gems and the seed was planted. “I started thinking I could incorporate them into décor somehow,” he said. Fate stepped in again after Tullgren moved to Florida. Friends in the furniture business needed his fluent Spanish to translate instructions to their furniture maker in Hialeah. Before long, Tullgren was designing furniture for their firm, Continental Classics. “Naturally, that led to my being hired to do interiors, and I opened my own firm in 1990,” he said. The Art Nouveau Fantasy beds are handmade of metal. A more contemporary style is upholstered. On the metal beds, the semiprecious stones – lapis, amethyst, rose quartz – are softly lit from behind. For the button-tufted upholstered headboards, the polished stones are button-shaped and incorporated into the tufting, which comes in 50 colors of silk shantung. 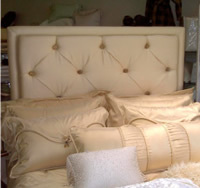 The metal bed was on display in the window at Andrea’s Las Olas Linens and Bath, a high-end bed linen store in Fort Lauderdale. “It was extraordinary and ornate. We’d never seen anything like it, and we had many inquires, but it was very expensive,” said Beverly Barnett, the store’s general manager, The $20,000 bed was sold to a client of Tullgren’s in Los Angeles. Then he came out with the upholstered version, Barnett said. “It’s more affordable and it’s been very popular because of the many fabrics and semi-precious stone choices. We sold maybe five in less than a year,” she said. Tullgren’s next project is two interior design television shows that are in development. “You have to go where life takes you,” he says. • Personal: born in Missouri, grew up in Chicago, Lighthouse Point and Europe. • Education: Florida State University degree in marketing, Instituto Tecnologico de Monterrey in Mexico, major in Spanish. Attended schools in Italy, Greece, London, Paris, Rome, Austria. Use the player below to listen to my recent radio interview with famed intuitive Dr. Helena Steiner-Hornsteyn where we talk about “Spirituality and Interior Design”.